When you travel as much as we do to far away places, it's easy to forget that some of the most beautiful and enjoyable destinations can be in our back yard. We were reminded of that during our recent visit to the Sarasota area. We stayed at the beautiful Lido Beach Resort for our two nights and three days of exploration and rediscovered why this area of Florida continues to be a favorite year round. Nearly everyone knows that Sarasota's fame began when John Ringling, of Ringling Brothers Circus fame, chose the city in the mid 1920's to build his winter home. It also became the winter home of the circus family, and many of their descendants still live here. The history of the circus is definitely alive at the Ringling Museum. Wear comfortable shoes and leave any heavy items in the car, because the complex is 66 acres of beautiful gardens and footpaths. Several buildings house memorabilia and items from the glory days of these spectacular shows. Most interesting was a large miniature replica of the arrival, setup and tear down of the various shows, animal displays and the main tent. Every item in that replica has been recreated to the most intricate detail, giving a true idea of what it took to organize and manage such a large entertainment enterprise. On Thursdays you can visit the woodcarver's station and meet some of the talented artists who design and carve circus animals. There are also interactive exhibits to design posters, read books and complete puzzles. 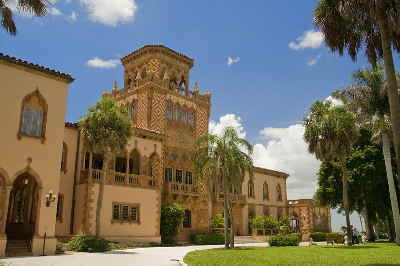 The Ringling Museum is also home to Ringling's exotic home, resembling a Venetian Gothic palace, which still houses many of the original furnishings. Visitors can take a self-guided tour of the ground floor which includes the living room, dining, kitchen and ballroom. To view the remaining floors you need to schedule a guided tour for a nominal fee. We felt it was worth it to get the full sense of the ambiance and lifestyle of that period. Ringling's bedroom was definitely unique, and his wife's bedroom adjacent was considered opulent for the times. But most impressive is the art collection that Ringling amassed over the years. More than 600 paintings, sculptures and antiques are housed in 21 galleries within the art museum, which could be the envy of any museum in a large city. To explore the entire Ringling Museum grounds you can easily spend most of a day, and you should. It is truly an impressive site. 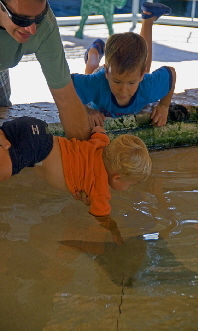 Another well known attraction in Sarasota is the Mote Marine Laboratory. This non-profit organization was formed in the mid 1950s by Dr. Eugenie Clark, one of the first female marine biologists of that time. A visit here underscores the mission of the laboratory as a marine science center, shark research site and marine hospital more than a regular commercial attraction. You are encouraged to take your time through all the exhibits rather than be herded to various scheduled events. It's certainly worthwhile to visit, with or without children. And if you are so inclined, the research center offers a hands-on opportunity for visitors to join a research charter on the water to measure, weight and tag species, record data and in some cases collect DNA samples. The research charters can include shark research, spotted eagle ray projects and fisheries research for grouper, snapper snook and permit. Few visitors to Sarasota can by pass yet another well known attraction, but this time hang on to your wallet! St. Armand's Circle was originally the vision of John Ringling to attract wealthy visitors and investors into the area. It was inaugurated in the late 1920's after the first bridge from Sarasota to the island was completed. Ringling's musicians would play their instruments in the bandstand that stood in the circle at the time. The circle still remains, and today, the 100+ shops and boutiques offer items for any budget. Outdoor cafes, luxury boutiques and restaurants offer an interesting stroll through this quaint part of town. Lush tropical plants, courtyards and patios and antique Italian statues from Ringling's personal collection mix with contemporary architecture and even non-shoppers will find it enjoyable. 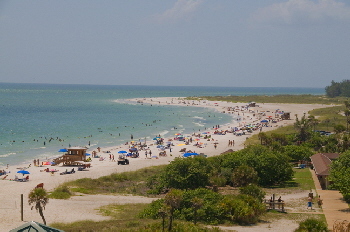 Take your time, relax and enjoy one of the less hectic shopping environments available in Florida! Just a couple of blocks from St. Armands is Lido Beach, and the Lido Beach Resort. This beautiful 12 -story resort offers the most outstanding accommodations in the area. From standard guest rooms to one and two bedroom suites, the facilities are amazing. 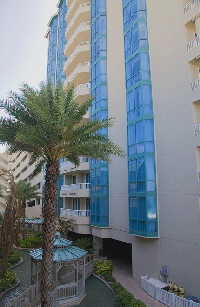 A covered parking garage provides guests with entry from any of the parking levels. Two towers are separated and also connected with a cool breezeway where gazebos and a freshwater pond combined with the foliage. The beautiful beach stretches for several miles, offering the crystal clear waters that we have come to expect at oceanfront resorts. And the food…let's talk about the food! Eating at some resorts can sometimes be "iffy." Not at the Lido Beach Resort. Whether eating breakfast at the scenic 8th floor restaurant, or having a quick bite to eat at the Cafe Lido off the lobby, the food was outstanding.